Let's take a look at statistics, use cases, and benefits of chatbots in m-commerce. Conversation drives sales and this is a well-known fact. For customers, it is important to have someone to ask questions and clarify doubts, someone who could guide them and recommend them the best option. Today, conversations can be automated, and today there is no need to have a physical person attached to each customer. Nowadays, conversational commerce became a fast-growing buzzword and chatbots play a key role in this field. Today, I would like to discuss why chatbots became so popular and why e-commerce and m-commerce companies heavily invest in it. First off, let’s make sure we are on the same page. What is a chatbot? A chatbot is a computer program or an artificial intelligence, which conducts a conversation via auditory or textual methods. It simulates how a human would behave in an automatic way, improving the efficiency of the process. Chatbots are mostly used for customer service, information acquisition, or lead generation. The most advanced chatbots are powered by artificial intelligence, helping to understand complex requests, personalize responses, and improve interactions over time. This technology is still in the development stage and has a lot of potentials. As nowadays everything goes towards automation, Chatbots allow people to get rid of routine tasks and focus more on a strategic side of the business. Besides, a tremendous speed of processing users’ requests with chatbots helps to gain customers’ loyalty. Let me highlight that quality is maintained and in some cases even increased as robots commit less mistakes than humans. Moreover, as chatbots don’t have emotions they handle the crises, conflict situations much better. There are two types of chatbots. The first type of functions is based on a set of rules, and the second type of functions using machine learning, NLP, AI. Chatbots that function based on a set of rules are restrictive. They can only respond to specific commands rather than interpreting a user’s language. Rule-based chatbots are great if users are only expected to have simple queries that refer to a limited set of information. As for the AI Chatbots, they function through machine learning to handle a wide range of conversations and requests from users. Instead of only responding to specific commands, AI chatbots can interpret a user’s language to understand and meet their needs. AI chatbots make sense if you want to handle complex queries and comments from users, for example, a user asking for a product recommendation. Surprisingly, Baby Boomers (age 55+) are more likely to expect benefits from chatbots than Millennials (age 18-34). 83% of online shoppers need support during shopping. Data from Google Trends shows over the last five years, search volume around “chatbots” grew 19x as individuals and businesses began to realize their value. And according to the HubSpot research report, 71% of people use chatbots to solve their problem fast. 56% of people would rather message than call customer service and 53% of people are more likely to shop with businesses they can message. 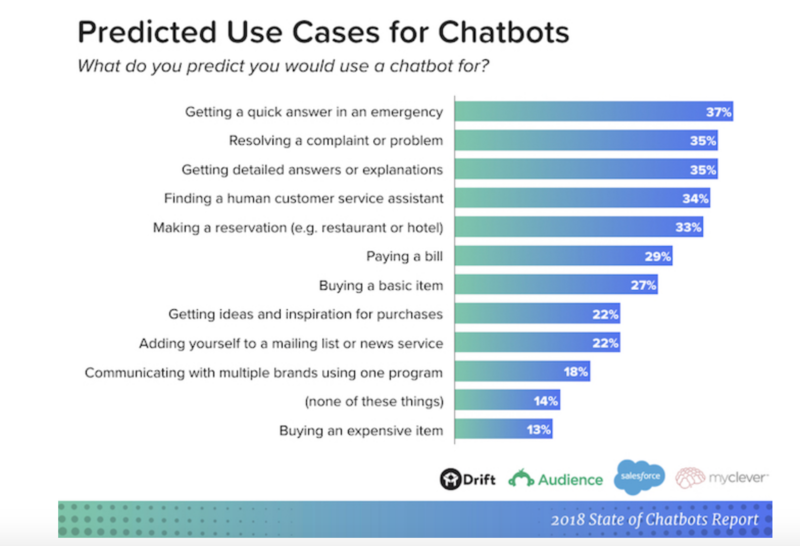 According to Ideal, 37% expect to get quick answers to questions in an emergency, 35% expect to get detailed answers or explanations, 34% use a chatbot as a means for getting connected with a human. 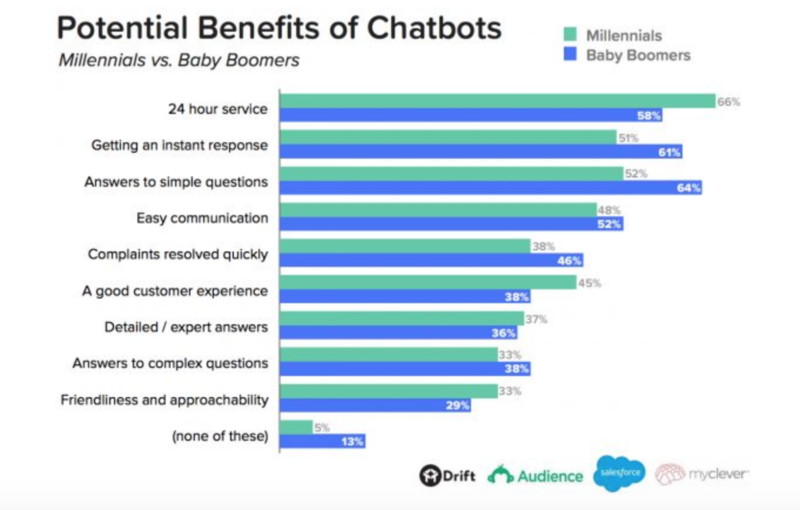 The biggest benefits of using a chatbot: 64% – the top benefit is the ability to get 24-hour service, 55% -getting instant responses to inquiries, 55% – getting answers to simple questions. In a survey by LivePerson, 38% of people surveyed felt positive about their chatbots experiences, while only 11% felt negative. As for the top concerns about using a chatbot, 43% of people report that they prefer to communicate with a human first and foremost, 30% worry about the chatbot making a mistake, 27% worry about accessing it only through a specific medium, 24% worry it won’t chat in a friendly manner. Let’s look at another Ubisend report to help realize the potential: 1 in 5 consumers would consider purchasing goods and services from a chatbot, 40% of consumers want offers and deals from chatbots, consumers are willing to spend more than $400 through a chatbot. Impressive, right? Well, artificial intelligence will be able to understand and remember everything you say or ask no matter how simple or complex. Talking to a computer will be as natural as talking to a human and of course people will start considering chatbots as a good source of information and an excellent solution for solving the issues in the most efficient way possible. Well, the global chatbot market is expected to reach $1.23 billion by 2025 with a compounding annual growth rate of 24.3%, according to a Grand View Research report. Makes sense, right? As the percentage of consumers who prefer to buy online is inexorably increasing every year, chatbots are becoming a must to be able to attend to each user that needs assistance. What Are the Current Most Popular Chatbots Use Cases? Order Food: Nowadays, it is extremely easy to order food online, especially with the help of chatbots by texting, tweeting, voice, or even from a car. An excellent example is Domino’s pizza. It lets you easily build a new pizza, buy it and track your order all from Facebook Messenger. Product Suggestions: Many consumers know they want to buy some shoes but might not have a particular item in mind. In this case, chatbots are a good solution, they can offer product suggestions based on what people want: color, style, etc. For example, H&M’s Kik chatbot can build an outfit for you. Customer Support: Brands like Airbnb, Evernote, and Spotify use chatbots on Twitter to provide 24/7 customer service. The main idea is to quickly provide answers and address customer complaints, or simply track the status of an order. Personal finance assistance: Chatbots make it easy to make trades, get notifications about stock market trends, track your personal finances, or even get help finding a mortgage. For example, some banks implemented chatbots to allow users to check their personal and investment accounts and recommend new investment opportunities. Schedule a Meeting: Nowadays, everyone is very busy and it becomes very difficult to set up meetings. But chatbots can do the work for you. For example, Meekan is an excellent example, it looks at everyone’s calendars to find times when everyone is available. Flights traction: Chatbots can search for best deals for you. They can compare flights based on price and duration. News: Chatbots help you stay up to date on the news or topics that really matter to you. Proactive / Automated. Example: when after the first purchase, chatbot sends a message with words of thank you and inviting a user to the special event that takes place in his city. Reactive / Automated. Example: A customer bought a coffee machine, but it doesn’t work well, so when this customer contacts the company, chatbot automatically recognizes the customer and the question and sends the correct guidance. By automating conversations that would require an employee to answer, organizations save time and money that can then be allocated to other efforts. Instead of having people doing manual, repetitive tasks or answering similar questions, those individuals may focus on more exciting things. Chatbots use direct messages to gather useful information to provide effective and relevant support. For example, chatbots can ask users why they ended up being on this website. Or people could use chatbots as an advisor for recommendations. Also, the chatbot will remember all customer’s choices and provide the customer with relevant choices the next visit. As well as serving as effective channels for informing or reminding customers about new products or promotions on the e-commerce store. Unfortunately, sometimes it is not clear where the information is. And sometimes users just leave the website because they couldn’t find the products they were searching for. And sometimes customers are not sure about what they really want and need. By asking a series of qualifying questions, chatbots route users to the best place for them to find the information they want. One of the most popular uses of chatbots is to provide quick answers in an emergency. 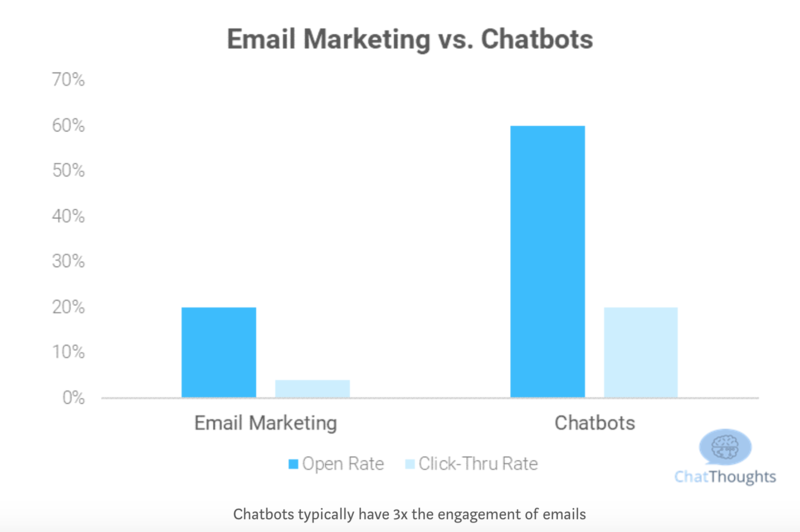 However, there are a lot of organizations that don’t offer 24-hour service and for them to increase sales without increased a lot the costs, chatbots are an excellent option. Chatbots offer a new and interactive way to engage with brands. Chatbots allow customers to clarify their doubts very quickly, avoiding having annoying calls and scrolling the FAQ sections. Also, let’s not forget about the human factor — mood and emotions. Humans react to others based on their mood and emotions. If an agent is having a good attitude or is in good mood he will most probably talk to customers in a good way. If the agent is in a bad mood, probably it will influence the way he responds to customers. Whereas chatbots don’t have this problem and always respond to questions in the right way. It is a well-known fact that humans can only concentrate on 3 to 4 things at the same time. If it goes beyond that humans are bound to meet errors. But chatbots can simultaneously have conversations with thousands of people. No matter what time of the day it is or how many people are contacting them, every single one of them will be answered instantly and correctly. Let’s be honest, no one likes doing the same work again and again. Chatbots now do this manual work, allowing people do what they really want to do. According to Rakebots, The stats predict that by the end of 2020 about 80% of business will adopt chatbot to increase their Business revenue. Sephora’s chatbot prompts it’s users to provide a few key details about themselves in the form of a quiz that takes seconds to complete, then users can move on to browse products, get personalized beauty tips, recommendations and more. Sephora also developed a chatbot called the Sephora Virtual Artist, that allows people to try on different lip colors using selfie photos. Sephora’s chatbots are helping consumers find deals and make purchases, but also make fashion choices and find products that meet their unique style and tastes. That’s something a simple e-commerce website doesn’t offer. eBay has a ShopBot, a virtual personal shopping assistant that helps people find the items they want. All customers have to do is type in some details about what they’re looking for and eBay will ask them all the relevant questions to find the perfect fit, style, and color for them. Since its launch, Shopbot users are nearly three times more likely to ask questions about specific products than those browsing eBay’s inventory. In this case AI chatbot improved the shopping experience beyond what a regular e-commerce site has to offer. It improved engagement, retention, and drove sales. Clothing retailer Aerie also implemented a chatbot that allows users to browse products based on personal preferences. They implemented was “this or that” option, users are shown an image of two different styles and simply have to press “This” or “That” to narrow down their tastes and find the right product. After a few rounds, the chatbot is able to make personalized recommendations based on the style preferences. H&M developed a chatbot that recommends products based on customers’ own preferences. It starts out by asking customers to select photos of clothing that they like. Then it asks customers to pick their personal style: Casual, Boho, Preppy, Classic, or Grunge. Once it creates a style profile, it can be used to create personalized outfits. Customers can order a pizza simply by chatting with Pizza Hut on Facebook or Twitter messenger. They can save their favorite pizzas to reorder with the touch of a finger. The bot also offers customers answers to frequently asked questions and info about their latest promotions. All customers have to do is like their Facebook page and set up their payment information. Trim is a fintech startup that launched their chatbot to scan bills for recurring subscription charges and ask users if they want to cancel a subscription. All customers have to do is write back “Cancel gym,” “Cancel Dropbox,” etc. Because of this bot, Trim has a 94% retention rate. Starbucks makes it very easy to place an order whether customers prefer using voice commands or text messaging. The chatbot tells customers when their order will be ready and the total cost. Available inside the Starbucks app for iPhone, Android, and Windows. Automat is helping companies use AI to talk to their customers, understand them and serve them better. It is a conversational marketing platform powered by artificial intelligence with the aim to provide a personalized one-on-one conversation with every customer. Wade & Wendy is a two-sided chatbot solution for both, recruiters and candidates. Wade & Wendy is building conversational AI chatbots to improve the hiring process. Wade is focused on career guide advising, suggesting to candidates the most suitable job offers based on the criteria learned through conversation. Wendy is the AI hiring assistant who will help recruiters to define the job offers and to recommend relevant candidates. Pypestream’s solutions are focused on providing customer services through chatbots and artificial intelligence. Thanks to automation, they promised to reduce the cost of customer services up to 80%. In a secure and private way, their platform allows driving transactions over messaging while at the same time offering promotions and rich multimedia content. Mezi is a personal assistant for all things related to travel, flights & hotels. Powered by Artificial Intelligence, it is a 24/7 concierge for traveling. Customers can travel like a VIP as Mezi handles all booking, rescheduling, cancellation, and everything in between. Demisto is industry’s first security operations platform that uses a chatbot solution to scale incident investigation, response, and reporting. The Demisto platform attempts to fight alert fatigue, develop an incident management process, and detect and manage threats. AdmitHub is designed for universities to increase engagement and connect with students using mobile messaging. Its goal is to instigate conversation, grow participation in university activities and support students. AdmitHub integrates artificial intelligence with human expertise to guide students to and through college. Its chatbot serves as a virtual campus coach that embodies the collective knowledge and unique spirit of the school community.